Though virtual reality may seem like a vision from a faraway future, that future may be closer than we think. 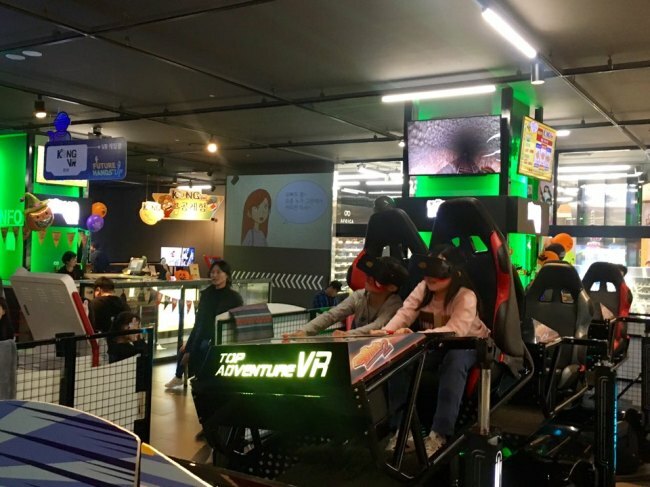 Virtual reality games are already amusing young Seoulites so much that the industry stands at the very heart of information technology powerhouse South Korea. According to VRfan, a local community website for VR enthusiasts, there are around 190 VR entertainment facilities nationwide. That number has increased 1,000 percent since 2016. VR entertainment -- ranging from short films to video games -- has established itself as a hip and riveting pastime for the country’s youth. Walking around downtown Seoul the words “VR room” stick out amid an array of signboards. And not even just in tech-savvy districts: The area is filled with cheap bars and rowdy crowds. From the outside, VR rooms do not seem like the ideal nest for high-tech dreams. Rather, they seem empty, with white walls and vacant spaces. Glass walls divide spaces into small rooms. Though VR rooms may seem unremarkable, the atmosphere in one is filled with excitement. Cries of fear and excitement, giggles and amazed gasps abound. After donning the required eyewear, grab the controllers with both hands and take a deep breath. You are ready to step into the future -- into the world of virtual reality. You can select games from a TV screen. Games like skiing, zombie hunting, a cooking challenge and cockroach killing. Young people in their late teens, 20s or early 30s make up the majority of the customer base. They come for new experiences, and they are curious about the latest technology in the headlines. “Before I did not know that the technology was so close to us. I thought it was something for the future, still (a long way from being translated into) reality,” said Yoon Sang-min, a college student in his mid-20s. The age range is wider here, with young children making up a significant portion of its customer base. Some attractions have minimum height requirements for safety reasons. “My boy is tech-savvy. He loves to play with IT devices, so we thought we’d stop by here while shopping,” said Park Hyang-mi, a resident of the neighborhood whose son is 11. “To actually go to an amusement park, my husband and I would have to take a day off. But it’s so much more accessible here. We still have time to go grocery shopping,” she said, laughing. A VR roller coaster offers a wild ride. Compared with a VR room, this 4D experience feels much more lifelike. The ride shakes and the wind blows. You get the same tightness in your gut as you do as when a physical coaster plunges down. The zombie hunt is even scarier. Users are taken into an abandoned mine to kill the undead. When the zombies try to seize the participants, the ride shakes, intensifying the sensation. While the popularity of VR content continues to thrive, the security of the owners’ copyright is in question. Illegal reproduction and use of the VR games is rampant across the country. Some small VR rooms use Steam, a global online game platform, to download VR games intended for home use and employ them at their facilities. Under Korean copyright law, protected content -- including digital music, movies, games and software -- cannot be used for commercial purposes without a license. But laws are often ignored in the nascent Korean VR market. One publishing business sued VR facilities this summer, saying the facilities had used a game that it held exclusive rights to without the proper authorization. The publisher’s employees had to conduct their own investigation, traveling to VR facilities across the nation to gather evidence. 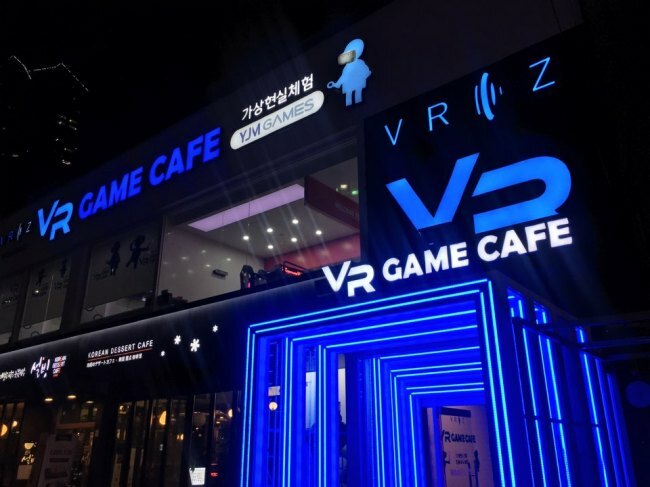 “Though most VR theme parks operate above board, many small VR rooms still use games illegally,” said Son Seong-hyun, who is in charge of VR game development at local VR game developer Numix Media Works. Under the circumstances, local companies are struggling to market their games. “As Steam is a global website, the majority of games are foreign. It has only been around three years since the government officially started to support the VR industry. We are still in the introductory phase,” Son said. Some local distributors are trying to change the industry. GPM is a local VR game publisher that mainly operates VR theme parks. The parks have an attraction called VR Cube, similar to a VR room. “We have around 50 VR games. Around 70 percent of the games are developed by local companies. The other 30 percent are foreign -- from Japan, the UK, Sweden, Spain and more,” said Nick Kim, manager of GPM’s relations team. According to Kim, local companies submit their games to GPM for screening. After being screened and undergoing the necessary modifications, the games are distributed to the facilities, where the public can finally gain access to them. “We are trying to service more games created by local developers. ... A game has no meaning if it does not have a platform for people to play it at,” he said.